In 1740 Admiral Edward Vernon enforced a reduction in the strength of the British Navy's rum ration. When his men complained, Vernon suggested the addition of limes and sugar to make the drink more enjoyable. "Old J" was created in honour of this unlikely mixologist who was known as "Old Grog". 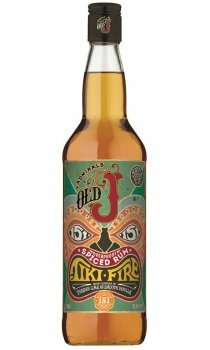 "Old J" Tiki Fire redresses the strength reduction by increasing the strength to 151 proof but keeps the great tasting spicing, lime and sugar to create a truly special rum. This rum has QUITE the punch to it, hence the name. Full of all the great flavours the less potent Old J is loved for (Lime, vanilla and caramel), but with a mindbogglingly strong potency. Certainly not for the faint-hearted! Drink this in SMALL amounts of you'll regret it, but what a fabulous treat it is! Tiki fire does have a burn to it that I and my partner really enjoy. There's a more pronounced butterscotch taste and it is still deliciously smooth and just perfect on its own.... although cranberry juice has been added too :-) definitely getting this again! !